The Ministry of Science and Technology of Vietnam and Australian Government have agreed on a partnership to work together in the fields of science, technology and innovation. The Australia – Vietnam Innovative Project -Aus4Innovation was officially launched on January 10. Aus4Innovation is designed to implement the Partnership on Innovation between Australia and Vietnam, which was initially established in APEC 2017 by former Australian Minister of Foreign Affairs and Trade Ms Julie Bishop and Minister of Science and Technology of Vietnam Mr Chu Ngoc Anh. “Through Aus4Innovation, we want to share Australia’s best knowledge and experience in both public and private sectors, in order to support Vietnam to utilize the benefits of new technology to build the future of the economy” – said Mr Craig Chittick, Head of Mission, Australian Embassy in Vietnam. Aus4Innovation is a 10-million Australian dollar cooperative development program, which was designed to strengthen Vietnam’s innovative ecosystem, build long-term partnership between scientists and researchers, and support Vietnamese Government and people in seizing the opportunities offered by Industrial Revolution 4.0. 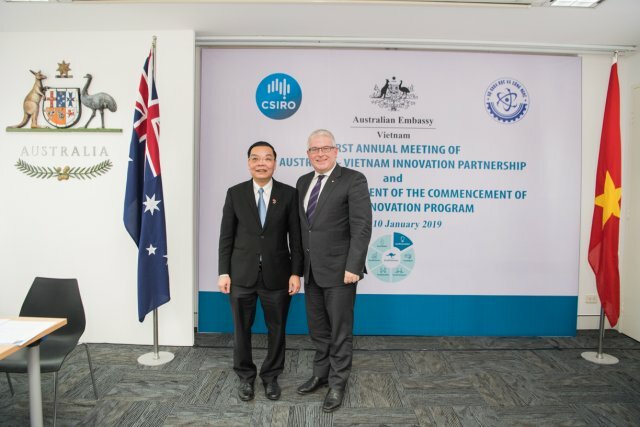 “Asia is on the threshold of major changes and Aus4Innovation program is an interesting opportunity for Australia to support Vietnam in utilizing their experience and skills, and establishing new and long-term science and technology connections” – Mr Chittick continued. The sustainability of Vietnam’s economic growth, particularly in agriculture and manufacturing, faces challenges as jobs move off shore due to rising labour costs, as automation replaces unskilled employment, and low technology adoption affects efficiency and productivity. Australia will support the Government of Vietnam to prepare for emerging challenges and technological transformation by building a stronger national innovation system. Partnerships between Australia and Vietnam public and private institutions will build local capacity and leverage new funding to ensure benefits well beyond the life of the program. Aus4Innovation will implement programmes to improve Vietnam’s innovation capacity through research commissioned to underpin preparedness for a digital future, industry relevant research and technology transfer in agriculture, and modes of creative thinking in education to feed an entrepreneurial and start-up economy. Australia and Vietnam researchers collaborate to identify scenarios of the impact of technological, environmental, geopolitical, social and economic trends on Vietnam’s economy over the coming 10-20 years. Agricultural technology transfer pilots in three priority locations (North, Central and South of Vietnam) to provide a model for private sector led Australia-Vietnam partnerships. Provide strategic input and advice to develop an agricultural innovation precinct and science commercialisation facility at Vietnam National University, Hoa Lac High Tech Park, Hanoi. Pilot an education initiative designed to teach high school and university students the relevant skills needed for the future workforce and influence curriculum development. Provide students and teachers open access to the latest soft, digital, entrepreneurial and mentor training modules. Improve the Government of Vietnam’s ability to develop policies that enable private sector investment, industry growth and entrepreneur support through sharing knowledge from commissioned research and pilot programs. Aus4Innovation will help discover emerging fields in the transformation of digital technology, experiment with new partnership models between organizations in public and private sectors, enhance Vietnam’s capability in technology, and formulate policies relating to innovation. Aus4Innovation is due to the collaboration between the Ministry of Science and Technology of Vietnam, Australian Embassy in Hanoi, Australian Department of Foreign Affairs and Trade in Canberra, and the Commonwealth Scientific and Industrial Research Organization (CSIRO).